Times are a-changing at Fitbit. The company best known for fitness trackers is now of course branching out into smartwatches, but it's also planning to use its wearable expertise to make a difference in the world of health tracking. Its wearables have already been used in over 400 clinical papers, but now Fitbit is looking more deeply at how its technology can be better applied to tackling serious conditions and disorders. Over the past year Fitbit has made its intentions clear: this is a space it wants to be more involved with. CEO James Park has publicly talked on numerous occasions about the topic and now the company has been busy investing, partnering and acquiring companies that could help shape its plans to build health monitoring wearables. Here's what we know about those ambitions from the companies it has snapped up and the tech it will use to make it happen, to the conditions Fitbit wants to tackle in a big way. Fitbit is hoping that sensors it has already built into its wearables can form the foundations for its bigger push into health tracking. At the heart of this next level tracking is its PurePulse heart rate sensor technology, which began life as a taped up prototype in 2011 before finding its way into trackers like the Charge 2, Alta HR and the Ionic smartwatch. While this sensor has been used predominantly for monitoring heart rate for exercise, its use for vital signs monitoring has always been an area of interest according to Fitbit's head of research Shelten Yuen. That sensor is now also able to offer insights into resting heart rate and stress through heart rate variability measurements. Fitbit believes it can use its heart rate sensor along with its software and algorithm knowhow to help detect a range of conditions. The key now is ensuring Fitbit's tech is able to deliver reliable data to offer those insights, and that's no doubt something it's hard at work trying to perfect. Fitbit's director of research, Subramaniam Venkatraman, revealed last year that the company was exploring heart health with this existing PurePulse tech. He also acknowledged that while using these sensors stationary is pretty reliable, the company may need to consider embracing the EKG heart rate monitor technology commonly used in hospitals to address the accuracy issue. It's a similar thing to what we were told by Yuen. The other sensor of interest is the one that lies dormant inside Fitbit's Ionic smartwatch. The new tri-wavelength sensor's party piece is that it is able to distinguish between red, green and infrared wavelengths. What that means is is that it is able to produce richer biometric information than was previously available on Fitbit's wearables. One of those pieces of data it can tap into is something called relative SpO2, which is a measure of oxygen in the blood. It's a sensor we've seen crop up in a wearable before when Withings (now owned by Nokia) launched its Pulse OX fitness tracker a few years ago. Fitbit is hoping housing this sensor in its wearables will unlock the ability to detect sleep apnea (more on that in a moment). We've talked the tech – now lets get into what Fitbit hopes it can lend a helping hand to in the health monitoring department. As far as harnessing its heart rate monitoring tech goes, Fitbit is exploring how to detect atrial fibrillation. For those now well versed in all things heart health, atrial fibrillation refers to having an irregular heartbeat, which can lead to the build up of blood in the atria (upper chambers of the heart), forming blood clots that could increase the chances of a stroke or heart failure. Fitbit hasn't been entirely clear about how it's going to pull this off, but it's hinted at a couple of ideas. The first is a symptom analyser and checker built into its companion phone app, which works alongside the heart rate sensor from a Fitbit device to determine if your heart is in working order. Another uses a system that will be able to let a user know when they should seek further medical help. Next up on Fitbit's list is sleep apnea, a disorder where you have one or more shallow breaths and pauses in breathing while sleeping. Symptoms of sleep apnea include loud snoring, morning headaches, depression and forgetfulness. It's a big deal because it can affect people of all ages and often goes undiagnosed. It can lead to an increase in the risks of high blood pressure and obesity, and can even cause a heart attack. 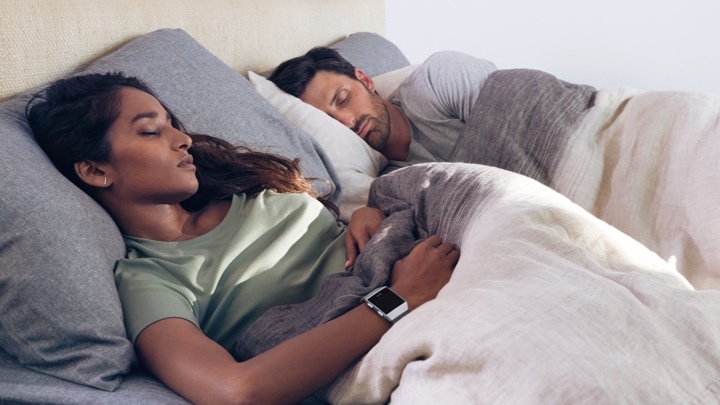 Fitbit is hoping to help diagnose sleep apnea using both its heart rate and tri-wavelength sensor tech to closely monitor the indicators of someone who might be suffering. Fitbit also wants to also help make a difference for diabetics by offering a continuous glucose monitoring solution. It's an area Fitbit CEO James Park spoke about when the Ionic smartwatch was announced, and he also told us it was a key area the company was looking at. As far as the technology and the sensors it intends to use for diabetes management go, it's currently doing that through partnerships and investments with companies that are already making great strides with this so it can bring the support to its wearables. We are sure this is with a view to offering its own non-invasive glucose monitoring solution, but that sounds like it could be a long way off, if perhaps not possible at all. Fitbit made its first ever investment this year when it plunged $6 million into Sano, a company that makes a coin-size glucose smart patch that can track glucose and help diabetics manage their condition. According to Park, it's a company that fits into Fitbit's larger strategy of complete health solutions and could lead to a deal where Sano data links up with Fitbit's wearables to relay the information between the two devices. There's also every possibility Fitbit could end up buying the company outright in the future. That's exactly what it's done with startup Twine Health, having acquired the MIT Media Lab spinout with a deal set to be completed over the coming months. Twine Health uses AI-powered insights and provides a service built to help people who suffer from chronic conditions including hypertension and diabetes. The goal with this acquisition, it seems, is to help create a better relationship between patients and their doctors. Fitbit is looking at other ways it can work to increase its health monitoring capabilities, and over the last twelve months has spoken about a number of partnerships to help do that. The most notable is the one it has struck up with Dexcom, which allows users of the G5 Mobile glucose monitoring patch to track their glucose levels on the Ionic smartwatch. Fitbit has also done something similar with diabetes management company One Drop where users of the platform will be able to sync Fitbit data to their account, freeing themselves of the burden of tracking the likes of activity, sleep and heart rate data throughout the day. There will also be an app developed specifically for the Ionic to make that easier to do. It's also partnered with American healthcare insurer UnitedHealthcare on a type 2 diabetes management pilot program where participants are given either a Fitbit Charge 2 or Ionic, which they'll use along with a Dexcom monitor, to see how their activity levels are impacting their glucose levels. What are the big companies up to in digital health?